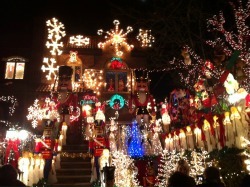 At Christmastime in NYC, nothing beats the extravagant holiday displays in Dyker Heights. However, the lovely mansion-filled, suburban-like neighborhood is fun to explore at anytime of year. While there aren't a ton of things to do here for kids, there are a handful of quality family spots like Dyker Beach Park, CityParks Junior Golf Center, indoor play spot BounceU and delicious restaurants serving up Italian eats. Our guide to Dyker Heights has the scoop on the area's best kids' attractions, family restaurants and everything you need to know about seeing the annual holiday Dyker Lights.